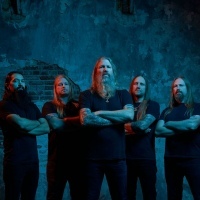 Swedish death metal band, featuring Johan Hegg - vocals, Ted Lundström - bass, Olavi Mikkonen - guitars, Johan Söderberg - guitars and Fredrik Andersson - drums. Originally called Scum until 1991. Album releases include "Sorrow Throughout the Nine Worlds" and "Once Sent from the Golden Hall".